The second planet in our Solar System is Venus. 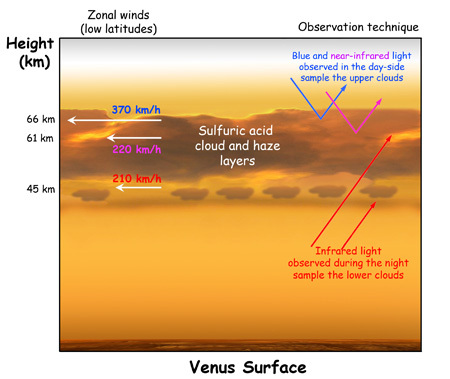 Often called Earth's twin, the properties of Venus are far from. While the density and radius are similar to Earth as is the presence of an atmosphere, the atmosphere properties and rotation are very different. 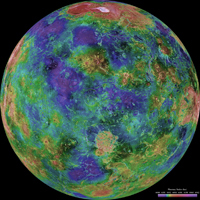 Like Mercury, Venus does not have a satellite moon (and Mercury and Venus are the only two planets of our Solar System that do not have any moons). 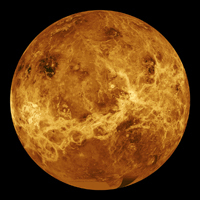 The surface of Venus has only been photographed by the Venera probes. The image above is from Venera 13. The probe survived for only 2 hours before being crushed by intense pressure and burned by sulfuric acid. Other views of the surface - as shown by the second and third image above - is possible by radar. While no evidence of tectonic activity exists today, the lack of impact craters on the surface indicates that activity did occur but not for very long. 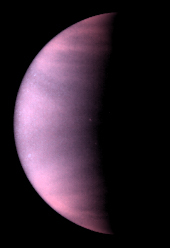 There are many unanswered questions regarding Venus. Careful study of the atmosphere can perhaps teach us a lesson in our own atmosphere. Additionally, the process of volcanism and the presence of lava flows remains an area of continual study.